Dusshera, also popularly known as Vijayadashami amongst Hindus is the begin call for festivities. It is derived from a Sanskrit word: Dasha-hara meaning Ravana's defeat (Dashanan ravan). It marks the victory of Lord Rama over the devil Ravana, who had abducted his wife Sita and hid her in his kingdom. 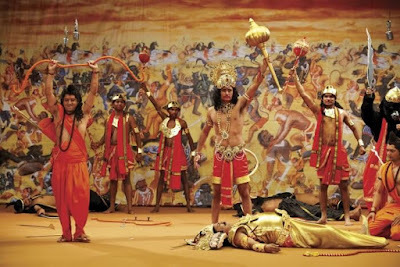 Lord Rama, along with his brother Lakshmana and Hanuman defeated him on the day of Ashvin Shukla Dashami and attained the authority of his land Lanka. But his love for his wife was so pure that he forgave the devil and let go off the land to king Vibhishana and returned back to his own kingdom, Ayodhya. This whole tale of lady love and dedication towards one kingdom is recorded in the holy book, the Ramayana. This win of righteousness over the wicked is the true symbolisation of Dusshera. Also, another tale popular amongst Bengalis which signifies the sanctity of this auspicious occasion is the victory of Durga Mata over the vicious Mahishasura. He defeated all the devas in heaven and wreaked a catastrophe on earth. Then, the three gods emerged a stark of lightning from their mouths and goddess Durga appeared. She had ten hands and each of her hand was bestowed with the weapons from all the gods. This female deity fought with the demon for whole nine days being celebrated as Navratri, defeating him on the tenth day. Thus marking the importance of the tenth day as Dusshera. This is why we Hindus worship Durga for 9 days and observe fast to pay respect and . On the tenth day, the fasts are officially over and we treat ourselves with a huge feast in the name of the goddess. The idols are immersed and the Durga Puja ends, adding to the social gatherings and food offerings to priests and idols being worshipped at home. The lightings begin and also the festive season advents with the celebration of Dusshera. Diwali, the Festival of lights is celebrated twenty days after Vijayadashami, thus signifying the onset of religious rituals and carnival times. This period is also the harvest season in India, inviting lot of farmers and cultivators to the land of Dusshera. Along with the typical Dusshera rituals, there are special rituals for the farmers which signify the origin of this harvest season. People pray for the enhancement of their fertile lands and hope for a healthy gatherings of their crops in that season. Dusshera begins the celebrations amongst Hindus all over India. Plays based on Ramleela are performed in every city. 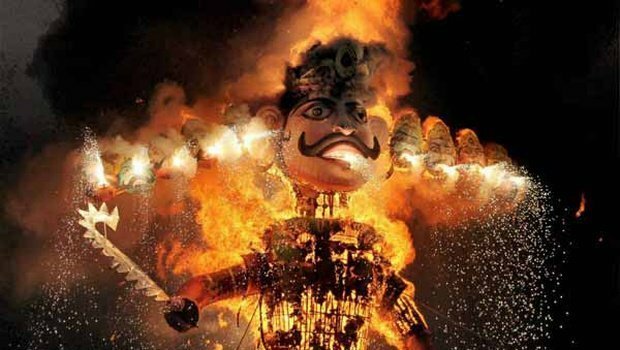 On the day of Dusshera, the effigies of devil Ravana and his evil brothers: Meghnada and Kumbhakarna are burnt. There are fairs and pandals set up at the outdoor grounds in North India. In South India, Vijayadashami is marked as a day of welcoming Durga and pay respect to their all female deities. In Karnataka, Dasara is even more popular than Diwali. People take out processions and usually follow the tradition of celebrating it with huge grandeur. The Mysore palace is decorated and its palatial appearance is a treat to all the eyes, not only for the people in India, but even the tourists who come specially to visit Mysore at the time of Dasara. Even in east India, Ramlila is organised and Dusshera is celebrated with great excitement and fervour. Thus whole nation comes together in one thread to celebrate the festival and welcome the cool weather. Truly, India is a land of unity in diversity.